From the 19th of July to the 29th of July this year I was invited by the World YWCA to join a training team of 6 women from the Pacific region in training and mentoring a group of 16 young women from the nations of Australia, Aotearoa New Zealand, Papua New Guinea, Solomon Islands, Fiji and Samoa. I’ve been involved in my local YWCA, YWCA Victoria, since I was 15 and attended a one day leadership workshop. In more recent years I’ve worked part time with YWCA Victoria and YWCA Australia on projects as diverse as website design and development, circus programs, homeless employment and job readiness for long term unemployed women. In my time with the Y I’ve been lucky enough to represent Australia in Mongolia, Hong Kong, Switzerland, Turkey and now, Fiji. So when I was asked if I would like to join the Pacific Training Team to work with 16 young women in Fiji, I jumped at the opportunity to continue with my involvement. 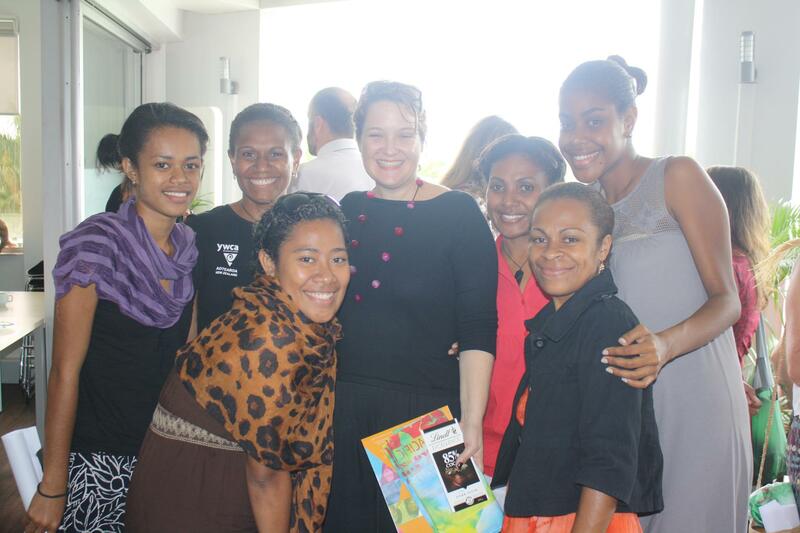 The Pacific Leadership Summit (PLS) is the first of its kind for the World YWCA. Traditionally, the Y will host Regional Training Institutes (RTI) which focus on a single area (eg: violence against women) and train a large number of women, including a percentage of women under 30, in the specifics of that issue in their region. The PLS was very different as it was exclusively open to women under the age of 30 who are already acting as leaders in their communities and the end goal was not just greater knowledge but the development of new leadership programs to be funded by the World YWCAs Power to Change Fund. For five days we worked 8:30am to 7pm with sessions on models of young women’s leadership, cultural issues facing young women across the region, program design, human rights and budgeting. The participants were required to pitch their program ideas to local funders such as UNFPA and AusAID and then present them to their association presidents for approval. As a member of the training team and the person in charge of all communications I was working long days every day, interviewing the participants for World YWCA project, mentoring the Fijian team and teaching circus skills. It was an utterly exhausting experience but as always, working with young people fills me with energy and enthusiasm. In the next months I will continue to work with the Fijian young women to implement their program, visiting Fiji at least once more before the end of the year and again in 2013. Then in March we will all reconvene with the young women involved in the Asian YWCAs version of this program in Thailand where we will reflect, evaluate and plan for the future. For me personally, being involved in a program like this brings to life what I find most meaningful in my work with young people, not just filling them with information but valuing their own life experience as genuine and important and giving them the tools to be masters of their own futures and the futures of their peers. In communities like Fiji, giving this sort of power to young people is culturally problematic, however with good planning, support and respect I hope that young women’s leadership can be a concept that flourishes across the region. It was an incredibly pleasure and privilege to be involved in this training and I while I expect the coming months to be incredibly challenging, I also hope that I will gain much from the experience that I can implement in my other work. I work with young people in the community on issues of health and wellbeing, particularly sexuality, mental health and body image. My greatest passion is spending time with young people and hearing their stories of their lives. In the Pacific YWCAs we have a leadership strategy that states young women need five things in order to become leaders in their communities. These are to be Safe, Respected, Included, Connected and Skilled. This might be a Pacific specific strategy but I think we can all agree that it’s a universal concept.